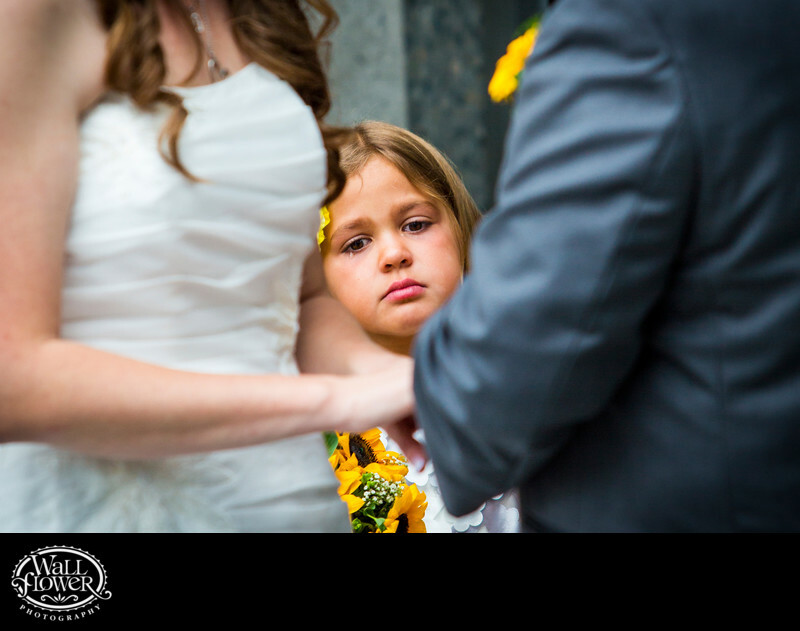 Such a precious moment captured in this wedding photo of the bride and groom's daughter tearing up while watching them exchange wedding rings during a ceremony in the concrete amphitheater bowl at the Washington State History Museum (WSHM) in Tacoma, Washington. This photo was shot from a considerable distance with an image-stabilized telephoto lens set to a wide aperture, rendering the bride and groom artistically unfocused so the girl's sharply focused face pops out. The yellow of sunflowers, the wedding's theme flower, gives a few bursts of color to an otherwise monochromatic scene.